In July 1829, Dr. William Gill was appointed District Surgeon of the newly founded town and district of Somerset. 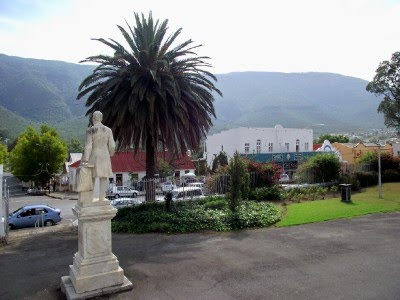 Upon his death in 1863, he left the main portion of his estate to found and maintain an institution for higher education in the Eastern Cape. His will stipulated that no portion of the estate was to be spend on the purchase or erection of buildings. Consequently, Somerset farmers and townsfolk pledged that they would erect the necessary buildings. Gill College was opened on 18 March 1869. Dr Gill’s remains were transferred to the spot where he now lies in front of the College he endowed. I have been checking the internet to see if the building in the photo is the Gill College Chapel which I think it is. I haven't found much, so that is how I state it till proven otherwise. 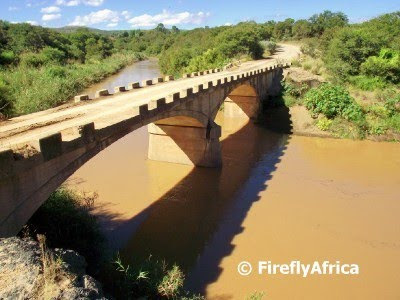 The Great Fish River is one of the great rivers of the Eastern Cape. 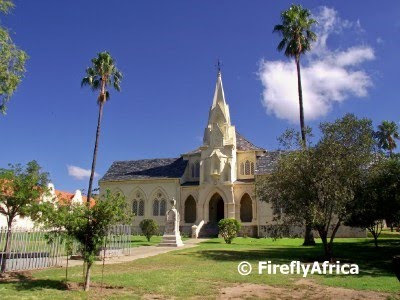 It originates east of the town of Graaff-Reinet and, 644 kilometers later, flows into the Indian Ocean about 30km east of Port Alfred. 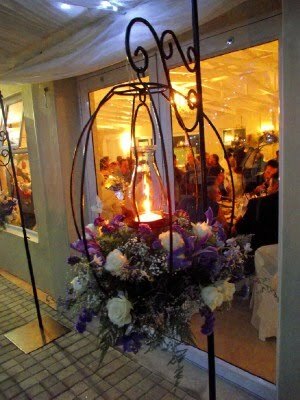 Even though the river originates in the arid Karoo, it generally runs all year around. It is possible to use water from the Orange River (diverted through the Orange / Fish River Pipeline) to keep up the flow during dry periods. At the river mouth the river is tidal for a distance of approximately 20 km. 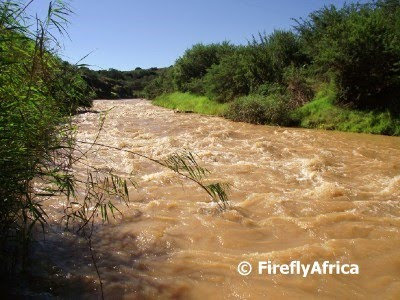 The Great Fish River is called "Great" to distinguish it from the Namibian Fish River. The bridge in the first picture is just behind the Karoo town of Middleton where both these pictures were taken. In the first picture the river is quiet and seemingly slow moving, but the second pic was taken barely 100 meters down stream. I know this isn't the happiest of pictures, but it still fascinated me when I saw it and I couldn't help taking a picture of it. It is a dead Cape Gannet which was washed up on the rocks at high tide. 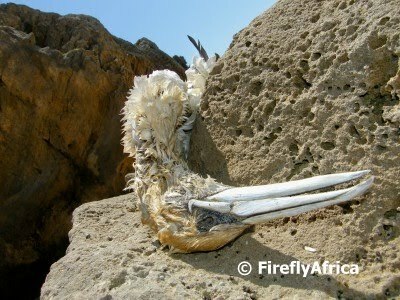 I have actually posted another dead gannet photo before (macabre isn't it?) which can be seen here. 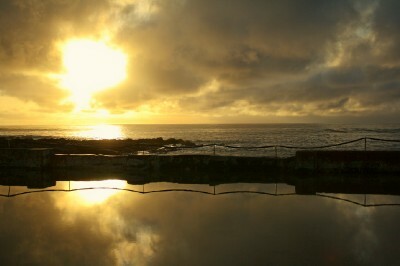 This picture was paired with a poem called Death by Benjamin Saccaggi on The Poetry Project website. How much of this will we destroy? How much of the world will we destroy? How much life will die? How much of ourselves will we kill? When we’ve destroyed our world? 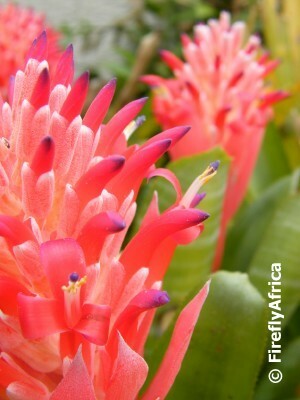 I photographed these Bromeliad flowers, called by some pineapple flowers, in a friend's garden a little while ago. 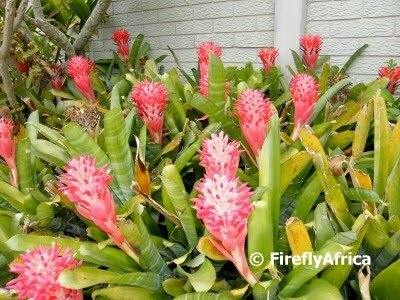 Bromeliads are members of a plant family known as Bromeliaceae (bro-meh-lee-AH-say-eye). The family contains over 3000 described species in approximately 56 genera. The most well known bromeliad is the pineapple, although the pineapple is the only edible one of the family. 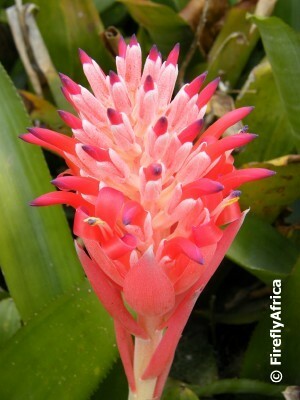 For more information, visit Bromeliad Society International. This last weekend we needed to get away, so we dropped the Rugrats at the in-laws and headed out to Addo Elephant National Park. 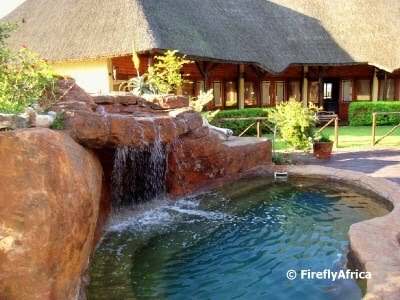 We drove through the park and spent the night at the four star Elephants Footprint Lodge in Colchester. The thatched lodge is ideally situated just outside the park's southern gate and a super spot to spend a couple of days while exploring the park and area. 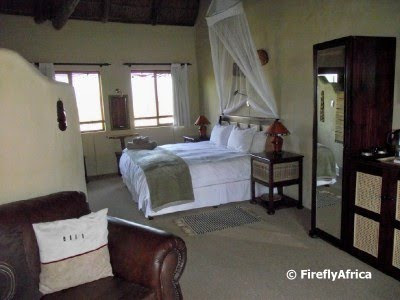 The lodge has 12 magnificent suites to relax in. The suites are so big that you won't be bumping into your partner (unless you want to) when you move from one end to the other, while the baths are big enough to have a water polo game in. There is even an (private) outside shower for those who like that kind of thing. After a hot day in the Addo Elephant National Park there is nothing as soothing as washing off the dust and cooling down in the rock feature pool at the lodge. This we followed up with a romantic sunset walk over the historic Mackey Bridge spanning the Sundays River next door to the lodge. We kept the best for last. 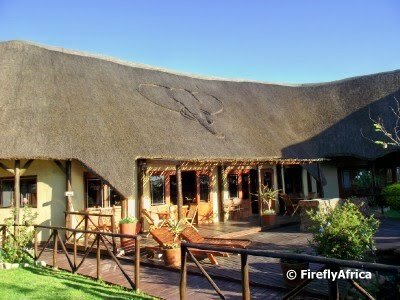 The Cooking Monster, also know as owner Geoff Applewhite, runs a restaurant from the lodge with a menu that includes kudu and ostrich steak as well as a wide variety of other dishes. 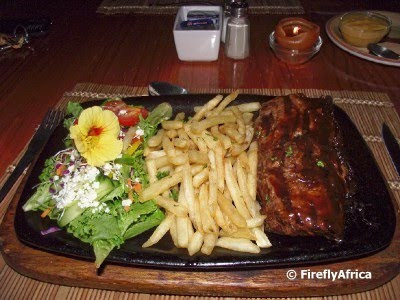 We both settled for Geoff's 300 gram rump steaks served with chips and salad. 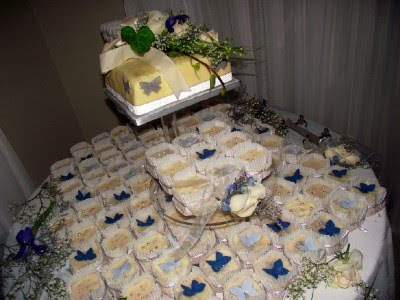 The Damselfly followed it up with cheesecake and I had pancakes with apple and cinnamon. The food was so good, I nearly chewed my lips off. Elephants Footprint Lodge comes highly recommended. A couple of week ago we spent the weekend at Sleepy Hollow camp site just outside Port Elizabeth. After a night of soft rain we woke up to literally thousands of flying insects crawling out of holes in the ground and taking flight. 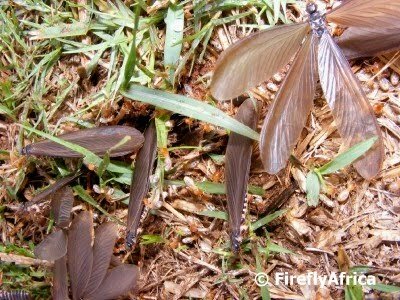 They were non other than Harvester Termites. The Harvester Termite doesn't build mounds, but nests completely underground. 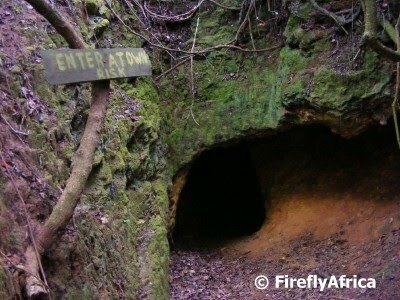 They collect grass and plant materials by night and on cool days which then gets transported underground into the nests. 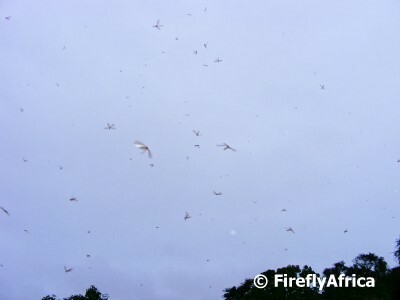 Winged "imagoes" (flying ants), which were what we were seeing that morning, emerges after rain. They fly short distances, shed wings and digs a chamber 25mm below the surface. The female would then attract males through pheromones and become the new queen of new colony. She will eventually become too big to move and lay 20 000 eggs per day for the rest of her life. Majority of eggs develop into workers while others will turn into soldiers and imagoes. It was amazing seeing these flying termites pouring out the holes and flying away. The kids were all commenting that they looked like fairies. 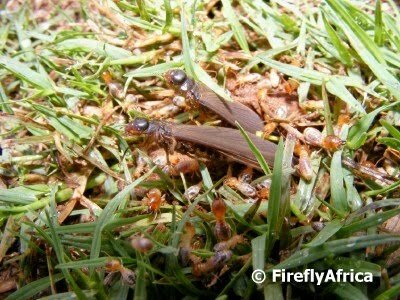 Interestingly, termites are distributed world wide but Africa has widest diversity of termite species. 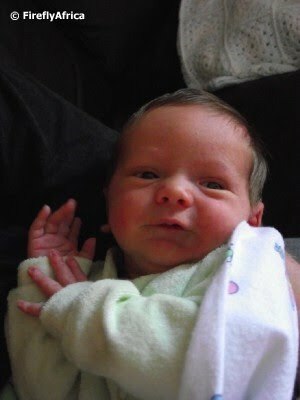 My Sister gave birth to her second child (see my announcement for Little L's birth here) two weeks ago. 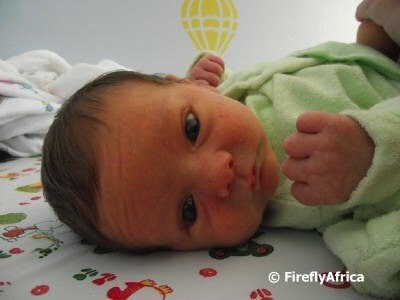 Baby Tiaan was born on Saturday 8 May 2010, the day before Mother's Day. 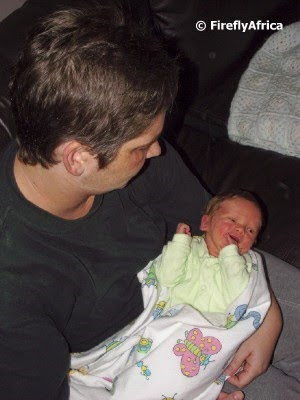 I was away when he was born so didn't get to visit them in the hospital. We did pop by last Sunday to meet the newest member of the family. He was sleeping for most of our visit, so I didn't get too many photos of him. I'm sure though that I will get the little hands and feet photography opportunity very soon. 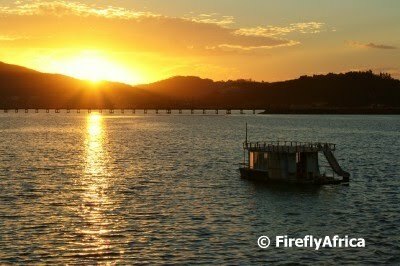 Sunset over the Knysna Lagoon on the Garden Route. 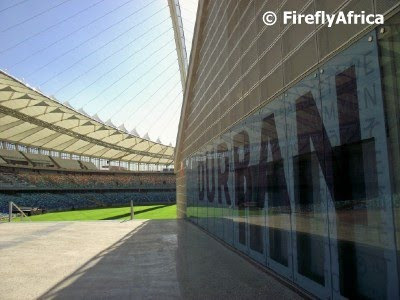 Last week on my trip to Durban I got to visit and tour the new Moses Mabhida Stadium. 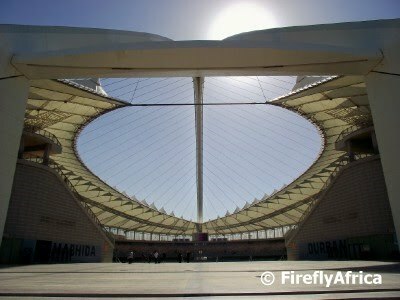 The 70,000 seater (54,000 seater after the World Cup) stadium’s iconic design has made it one of the most admired of the 2010 FIFA World Cup stadia and has created an unmistakable silhouette on the Durban skyline. The stadium's most unique feature is its 106m high grand arch. 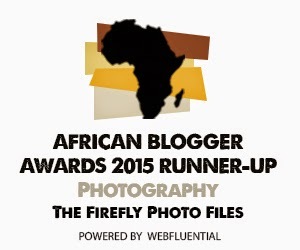 It represented the unity of a sport-loving nation and was inspired by the South African flag. The two legs of the arch on the southern side of the stadium, come together to form a single footing on the northern side, symbolizing the uniting of a once-divided nation. The arch isn't just feature. It has a cable car which takes visitors up to its highest point from where they can get out and enjoy breathtaking, panoramic views of the city and ocean. Unfortunately on our visit there wasn't time to do the trip as the bus was waiting for us. The roof is made of 46,000m2 of Teflon-coated glass fibre membranes, which produces a translucent glow when the stadium is lit. 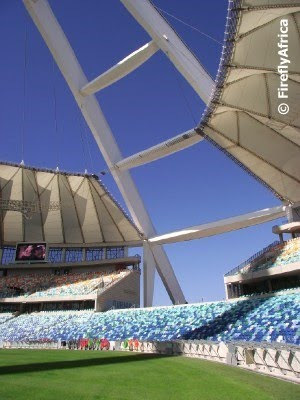 The roof is attached to the arch by 95mm-diameter steel cables. 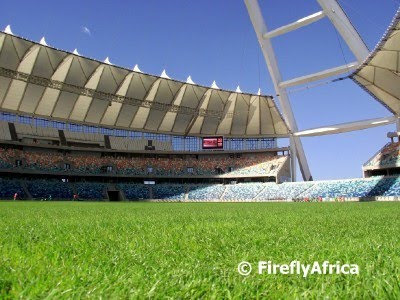 The seats at the bottom of the stadium are shades of blue representing the ocean while those at the top are shades of orange to represent an African sunset. The reason for the seats all being different colours is for the stadium to always have an illusion of being full, even when its not. For me the best view of the stadium was from its southern end. The perfectly symmetrical shape made for an awesome photo. I did see the stadium at night as I drove past, but it would have been awesome seeing it fully lit. Looking in the gate at the old church in Middleton. I didn't want to post this pic along with the original post as I thought it could stand nicely on its own. I have had a second picture selected to be paired with a poem on The Poetry Project website (and hopefully the book that will follow). Its a site run by a cyber friend of mine who takes poems from relatively unknown poets and pair them up with pictures from local photographers. The first one was used with a poem called At God's Gate. 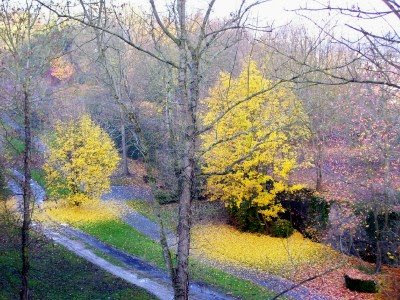 This time around my picture below was paired with a poem called Autumn by Aboo Hansa. 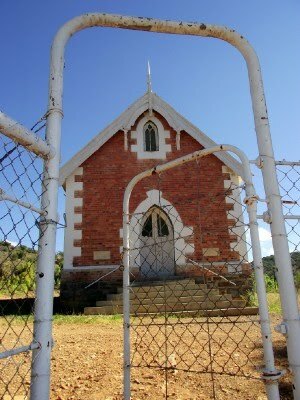 On our recent visit to Somerset East we stopped at Middleton between Port Elizabeth and Cradock. While the Damselfly and Rugrats were browsing through the farm stall, I had a closer look of the historic Methodist church that stands at the entrance to the village. 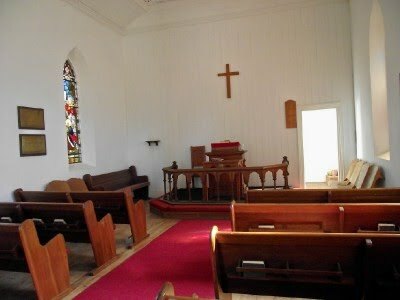 The guy working in the shop asked me if I would like to see the inside of the church and unlocked it for me. 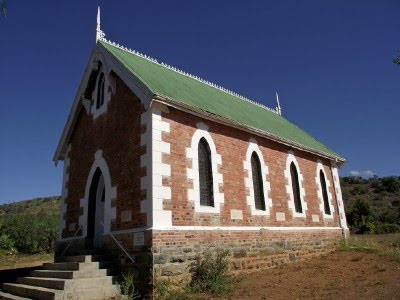 The church, built in 1903, is what you would call quaint. It only has 5 rows of seats and has services in it every Sunday for the residents of the village. 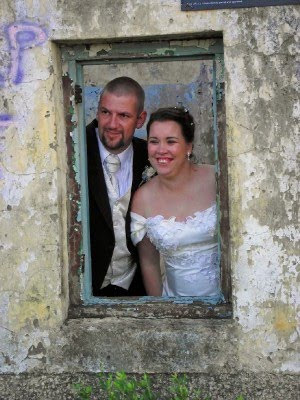 The services are run by the Noupoort Christian Care Centre who owns the village and uses it as part of their rehabilitation process for drug and alcohol addicts. 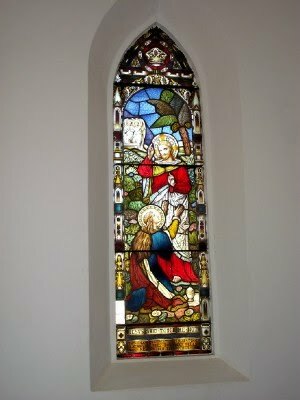 The church has two stunning stained glass windows in the front which the guy was quite proud of as he asked me a couple of times if I got a picture of them. Barrelling along the N10 between Port Elizabeth and Cradock, most people don't even notice the little historic one horse Karoo town of Middleton. Situated about 20 km before reaching Cookhouse, Middleton is a charming little village steeped in history dating back to 1879. 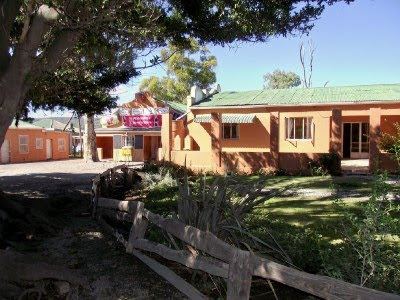 The village is situated next to the Great Fish River and includes the Middleton Manor hotel, a restaurant, pub, general dealer, bottle store, post office and camping site. What makes the village unique is that its privately owned. It was bought by the Noupoort Christian Care Centre (NCCC) some years ago. 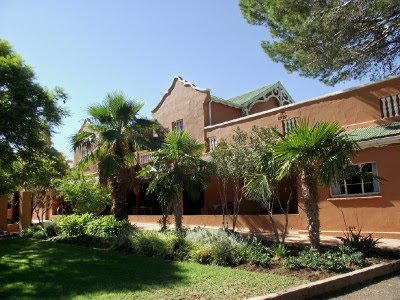 NCCC is a drug and alcohol addiction rehabilitation centre. They place those who have rehabilitated and those still rehabilitating in Middleton as part of their second fase of rehabilitation. The residents are entrusted with everything from finances, to purchasing, stock taking, cashing up and the general running of the projects available. This trust given to those rehabilitating builds self confidence, self esteem and a sense of achievement which is paramount in completing recovery. From the road passing motorists can't see much of the village other than the bright pink farm stall and the historic little Methodist church, which I will post about tomorrow. 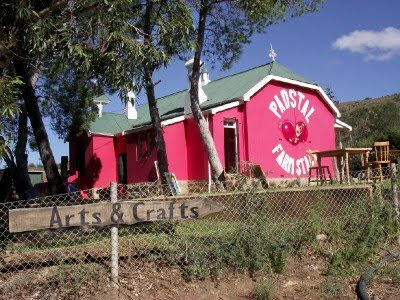 So if you do slow down on your way to the coast, do pull over and go have a look at this extraordinary little village. In South Africa buildings, places and things of historical and cultural importance were declared National Monuments by what used to be the National Monuments Council. 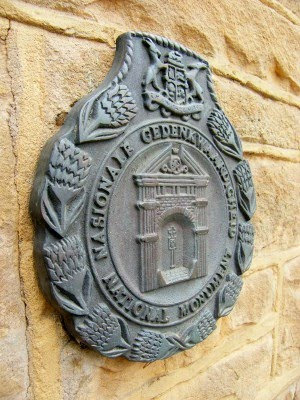 Each place was then given a brass plaque which was mounted somewhere prominent. Unfortunately a lot of these plaques have been stolen over the years and sold as scrap metal. The National Monuments Council has now been replaced by the South African Heritage Resources Agency (SAHRA). What used to be known as National Monuments are now termed as Provincial Heritage Sites and will in future receive a provisional heritage site badge. The next step is going to be identifying places with qualities so exceptional that they are of special national significance and to declared them national heritage sites. I have posted a lot of sunrise and sunset pictures for Skywatch Friday lately, so today I decided to look down to look up. 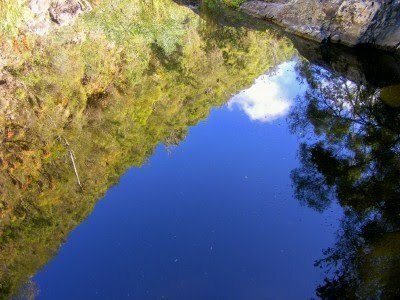 I got this reflection in one of the river pools at Sleepy Hollow just outside Port Elizabeth on our last camping trip. The water was perfectly still and gave me the opportunity to get the perfect sky reflection. For more looking up (or down) sky pictures, visit Skywatch. 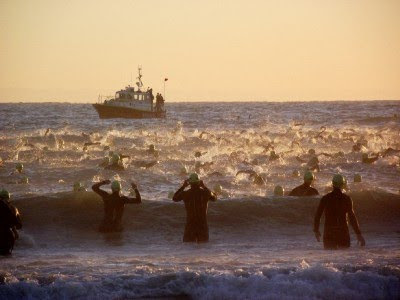 The competitors in Ironmann South Africa setting off on the 3,8km swimming leg at Hobie Beach in Port Elizabeth. In the background is the the boat of the National Sea Rescue Institute (NSRI). For more of my pictures of Ironman SA, go here. An interesting site I found next to the Somerset East Museum was the grave of Ouma (Grandma) Dora Dotyi Jacobs. Ouma Dora was born in May 1880 and was 122 years old when she died in January 2003. At the time she was the oldest living person in the world. 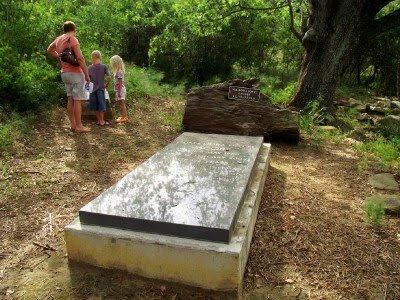 She was laid to rest in a special place under the trees next to the museum. To get to her grave one has to walk down a path between the trees and the grave is in shaded clearing. 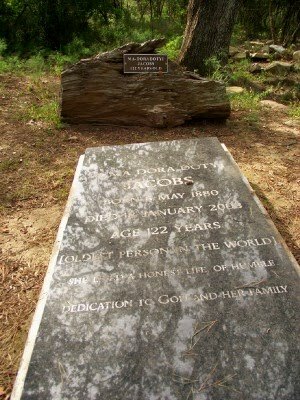 Standing there looking at the grave one realises how a peaceful spot and perfect last resting place it made. 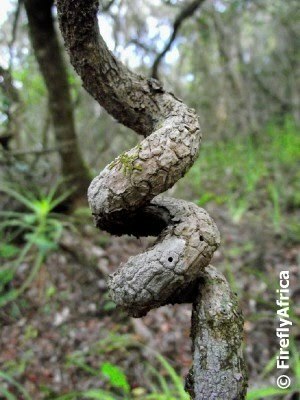 I stumbled on this bracket fungus growing on a tree stump in Somerset East. Back home I found the following information about it. 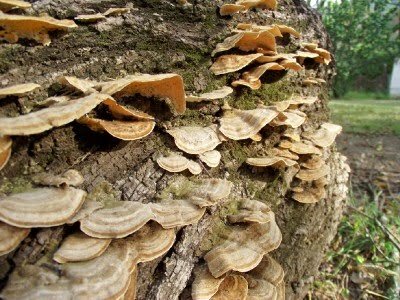 Edible bracket fungus is normally found on dead hardwood trees in summer and autumn. 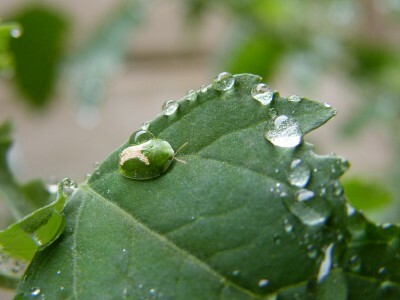 It normally grows up to 350 millimeters wide and 5 millimeters thick either singly or in clusters. The cap is normally smooth but leathery or woody in texture. The colours range from white to creamy while they can have a fragrant spicy smell. 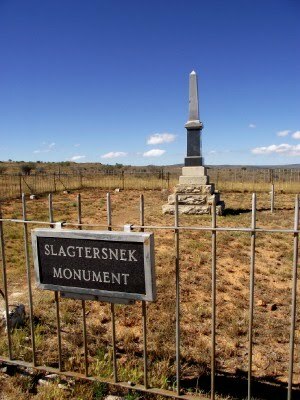 Just outside the Karoo town of Cookhouse stands a monument in remembrance of the Slachters' Nek Rebellion. The Slachter's Nek Rebellion was a Boer uprising against the British colonial power believed by them to be hostile towards the Afrikaner farmers. The rebellion came to an end on 9 March 1816 when five rebels were hanged in public at Van Aardtspos close to where the monument stands. Four of the nooses broke during the procedure, as the hangman who came to perform the execution had not realised that there were five to be hung, and old rope had to be used. The four whose ropes broke, and the public, pleaded for their lives, but Col Culyer ordered that they be hanged a second time and more ropes were obtained. 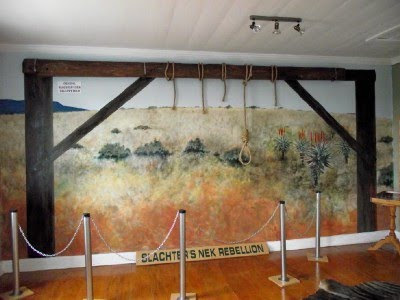 The picture above is part of the Slachter's Nek exhibit at the Somerset East Museum. 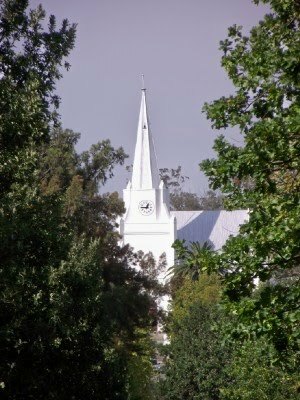 One of the main landmarks in Somerset East in the Karoo is the Dutch Reformed Church (NG Kerk) in the main street (Nojoli Street). 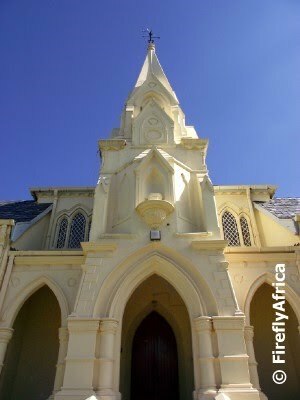 The proposal of the local Heemraden to erect a Dutch Reformed Church in 1825, was accompanied by the submission of a design in which Cape Dutch and Gothic architecture were cheerfully blended. The Eastern facade had a Dutch Renaissance tower rising from an impressive thatched nave. The foundation stone was laid in 1830, but the building was not ready for consecration until 1833. It was enlarged in the 1870’s and was modified in the 1950’s. The building was again restored in the early 1970’s. The first minister was the Rev. George Morgan. He was followed by the Rev. John Pears and the Rev. 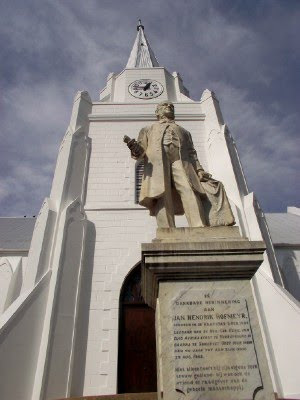 Jan Hendrik Hofmeyr, who's statue stands in front of the church's main entrance. Boschberg mountain behind the town.